Crispy Tofu Broccoli Stir Fry - Fast and Easy! This crispy tofu broccoli stir fry is ridiculously easy and perfect when you want dinner on the table really fast! I show you a simple way to make crispy tofu without deep frying it, and the broccoli adds a nice crunch to the recipe. If you are looking for more vegetarian options to add to your dinner menu, then this has a nice mix of protein and vegetables to keep you feeling full. Imagine crunchy tofu and broccoli tossed in a five ingredient sauce that is sweet and spicy. 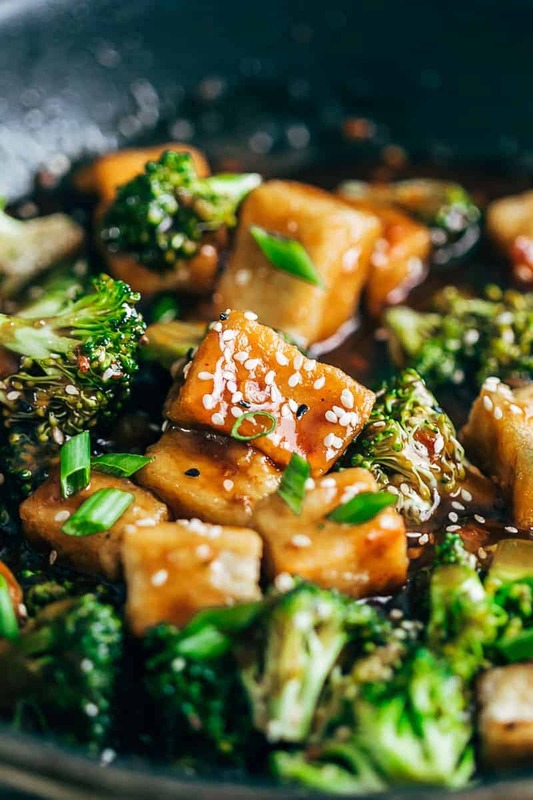 The sauce just glazes over the tofu and broccoli, so that every bite is bursting with flavour. Throw in some noodles and you’ve got the dinner of my dreams. Tofu can be really tricky to cook with. Because you have so many varieties available – silken tofu, soft tofu, hard tofu etc etc. And if your tofu is too soft then you have to press the water out and even then it can crumble all over. Which I don’t enjoy because I want to bite into the tofu. I want the exterior to be crunchy, and I don’t want it to become a tofu broccoli mash. 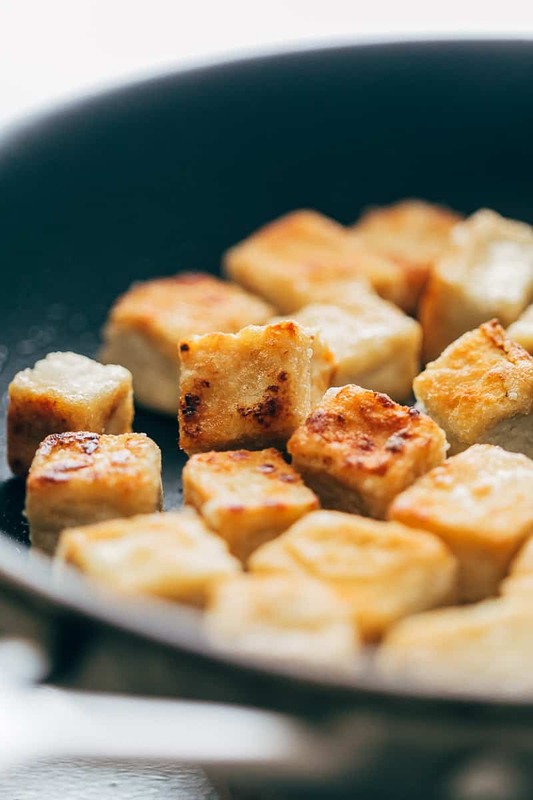 To make crispy tofu at home, I recommend starting with extra firm tofu which will hold its shape. When you open the pack, and take the tofu out, there might still be liquid. Be gentle and carefully dab any extra liquid on the tofu with a kitchen towel. Cut into pieces and toss them lightly in cornflour, salt and pepper. The cornflour dusts the tofu, and helps it hold its shape, while making the outside crispy and keeping the inside moist. A little oil – about a tablespoon or so on a non stick pan is all you need to pan fry these a nice golden brown. It takes a few minutes to brown the tofu on all sides but what you are left with is crispy tofu that also makes an amazing snack. This recipe is light on the stomach because its so full of broccoli. And thats how I like it! More broccoli than tofu, but you can easily change the mix. We are not going to blanch the broccoli or cook it before hand because we want it to stay crunchy, and just a slight simmer in the sauce will make sure its crisp to bite but cooked. The cook time for this tofu broccoli stir fry recipe is no longer than 15-20 minutes. Once you have’ve made your tofu, the rest of the recipe barely takes 10 minutes, so you won’t have time to chop broccoli or whisk the sauce while everything else is cooking. Its important that you prep all the ingredients beforehand so that when you are ready to cook, everything goes into the pan one by one and you are done. This is what keeps the broccoli and tofu crunchy! 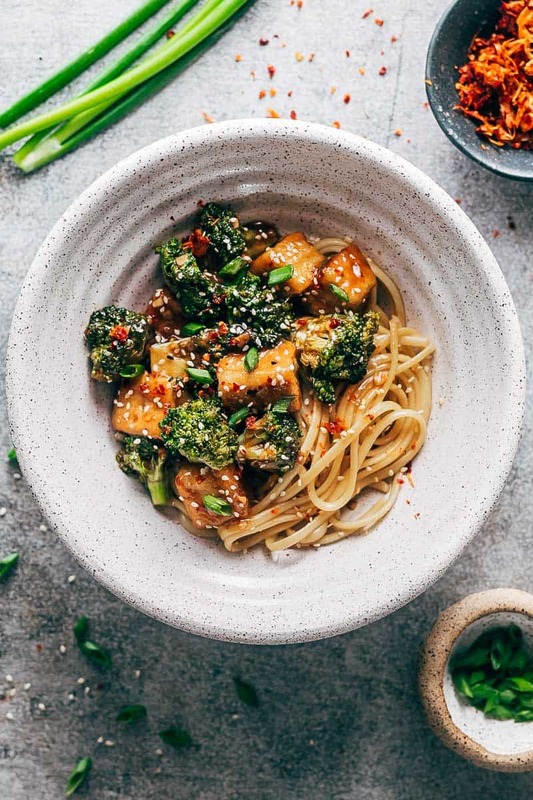 I served this crispy tofu broccoli stir fry with noodles for dinner, but I really love this with brown rice and quinoa too when I want something healthier. Or try this with my Asian Cauliflower Rice – they work together like a charm! 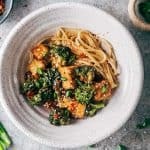 This crispy tofu broccoli stir fry is fast and easy, and I’m showing you how its possible to make crispy tofu at home without deep frying it. This vegetarian recipe makes just enough sauce to coat the tofu and broccoli so that they don’t get soggy and still retain a crunch. Isn’t that the real pleasure of eating a good stir fry? If you can’t find extra firm tofu, remove the tofu from the packaging and place it on a chopping board. Place a flat, heavy object on top and let this sit for 15-20 minutes. Or you can get one of these fancy tofu presses which essentially does the same job of removing extra liquid from the tofu. This was delicious, especially considering how little work was involved — super easy and quick. I didn’t have long so I threw some jasmine rice into my instant pot while I put it together. I added a splash of mirin (rice wine) to the sauce and served with crushed peanuts and Sriracha as well as sesame seeds and green onions. Will definitely make again. Jasmine rice would go so well with this! So glad you enjoyed it!